Alden Ehrenreich to be Han Solo | Nerd Much? **Update 5/6/16: A brief update, as Alden Ehrenreich is officially going to be the new pilot of the Millenium Falcon, according to The Hollywood Reporter. He will play the iconic role of Han Solo for the upcoming yet-to-be-titled Han Solo movie, one of the many upcoming Star Wars movies we’re looking forward to. It looks like we’re one step closer to finding our young Han Solo actor. Deadline is reporting that actor Alden Ehrenreich has taken the lead to become the front-runner to play Han Solo in the upcoming Han Solo spin-off Star Wars film. According to their sources, Ehrenreich appears to be the new favorite after impressing in recent screen tests, beating out Taron Egerton and Jack Reynor. Of course, the news isn’t official, but Deadline is a solid source, especially when it comes to casting breaks. Ehrenreich was most recently seen in Hail, Caesar!, and has starred in the highly-rated Running Wild and Blue Jasmine. 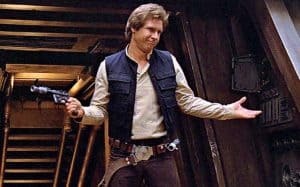 The Han Solo film is still wrapped in mystery, but we know it’ll focus on Han’s days before he helped the Rebel Alliance. The film will be directed by Phil Lord and Christopher Miller, the directors behind The Lego Movie. The Han Solo movie release date is tentatively set for May 25th, 2018. Other than that, no other tidbits of knowledge are considered fact just yet. Stay tuned to Nerd Much for more on all things Star Wars-related.